David Richmond CBE was today announced as the new Chair of Boccia UK, taking over from John Dowson who was in post for six years. Boccia UK is the National Governing Body for the Paralympic sport of Boccia in the UK. Their primary role is running the World Class Programme and, using funding from UK Sport, they send players to sanctioned international competitions to qualify athletes to represent Great Britain and Northern Ireland at the Paralympic Games. David has a background in the military and charity sector and most recently as an independent consultant. He served as an Army officer for 26 years and was seriously wounded in 2008 whilst on operations in Afghanistan. After being medically discharged in 2012, he joined Help for Heroes as their first Director of Recovery and was responsible for developing the vision for their Recovery Services and turning it into an operational reality. He was also Team Director of the UK Invictus Games Team for the first three Invictus Games. Boccia UK are delighted to announce that Jane Jones has been appointed as a new independent Board Member. Jane has a wealth of experience in Advertising, Communications and Marketing. As Director of Communications and Marketing for the British Paralympic Association (BPA) she led the commercial and communications strategy for the British Paralympic Team at London 2012. She currently works freelance advising sports organisations on marketing and commercial strategies. She is also a member of the IOC communications Commission, a trustee of the British Para-Orchestra and sits on the Franchise Board for a Super league Netball Team. Jane will officially take up her appointment in March 2019. Welcome to the world of Boccia Jane! The search is on for a new Chair to take Boccia forwards to Tokyo and beyond. The search for a new Chair to take Boccia forwards into Tokyo has begun. This highly successful Paralympic sport is looking for a dynamic, enthusiastic and inspiring individual who would like to join a team that is committed to winning, in the right way and for the right reasons. If you think you can support and guide us on our journey to Tokyo please click here for further info. To apply for the position please email a CV and covering letter detailing your suitability for the position to dawnbrown@positivedynamics.co.uk by Friday 25th January 2019. The international boccia federation has hailed the BISFed 2018 World Boccia Championships (12-18 August) as a key turning point in the development of the sport worldwide. “The Organising Committee have been so committed to making this not only a fantastic experience for our athletes but also a must-see spectator event. And they have certainly delivered. We have enjoyed seven days of world class action. “The athletes have been blown away by the World Championships – and they love the innovative layout of the field of play. For the first time in a boccia event, spectators have been able to get up close to all the action with courtside seating on the eleven outside courts. A central show court with aerial cameras has really added to the drama of the event. “Winning here means everything. The crowd have been awesome. I've really enjoyed it - the layout is spectacular. This is how Boccia be should be done and I hope the rest of the world take note. The venue’s great. The hotel’s great and the courts are cool as well. Boccia is the world’s fastest growing Paralympic sport and organisers have also been keen to leave a legacy on the city of Liverpool. Come and try sessions have taken place every day of the Championships as part of a much wider £32,000 Boccia England legacy programme, funded by Sport England, which will see the establishment of a brand new club in the city. Japanese broadcaster NHK also secured rights to televise the event and will be airing a documentary later in the year; building towards its coverage of the 2020 Paralympic Games. The BISFed 2018 World Boccia Championships has been made possible thanks to UK Sport’s National Lottery funding through its Major Events Programme. The Championships are drawing to a close with a Closing Ceremony which will feature choir, Only Boys Aloud, who finished third in Britain’s Got Talent in May 2012. David Smith MBE was once again the star as GB amassed a haul of four medals from the BISFed 2018 World Boccia Open Povoa, Portugal. Smith romped through the Individual BC1 competition, winning seven matches on the trot to cement his status as World Number 1 heading into the World Championships in Liverpool in August. GB won two medals in the Individual BC3 competition. The final pitted World Number 2 Jamie McCowan against Greg Polychronidis of Greece but, having won his previous five matches, succumbed 0-5, finishing with the silver medal. Polychronidis also accounted for Patrick Wilson in the semi-final but he bounced back to take the bronze medal from another Greek, Anna Ntenta. In the Individual BC4 World Number 1 Stephen McGuire rallied after a surprise loss in his first match to make it to the semi-finals, where he was beaten by old rival Samuel Andrecijk of Slovakia. He was unable to claim the bronze losing a tight match 3-4 to Pornchok Larpyen of Thailand. McGuire did leave Portugal with a medal though as he teamed up with Evie Edwards and Louis Saunders to clinch BC4 Pairs bronze. The Slovakians again accounted for GB at the semi final stage but Canada were vanquished in the playoff to bring GB's medal tally to four. Neither the BC3 Pair nor BC1/BC2 Team were able to advance through the pool stages. The best of British Boccia descended on a sunny Largs in Scotland for the 2018 United Kingdom Boccia Championships and World Rankings held true as each class was won by the highest ranked player. David Smith MBE continued his incredible run of British Championships as he captured the title for the 15th time. 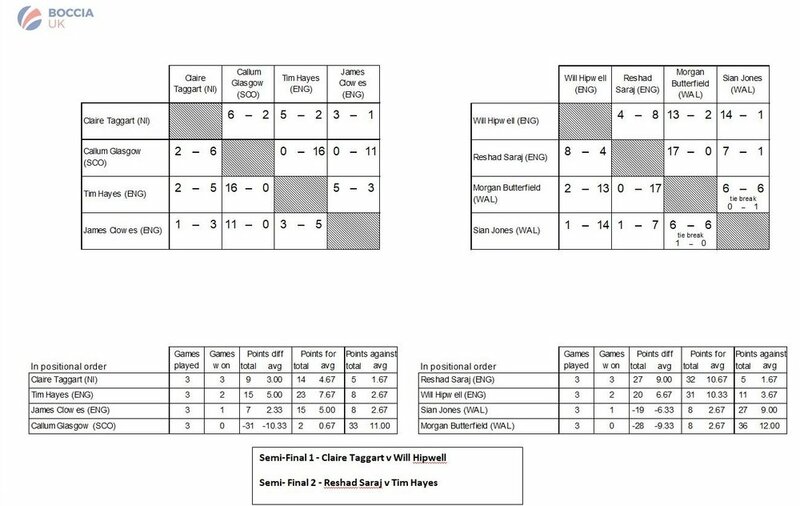 Claire Taggart won her maiden UK crown in the BC2 class while Jamie McCowan became the first player to be a UK Champ in two different classifications as he took top spot in BC3 having previously taken the BC4 Gold. Stephen McGuire continued his run of winning every competition he has entered in 2018, dominating the BC4 classification. After the first day of the 2018 UK Boccia Championships the semi finalists in BC1, BC2 and BC4 are known whilst there are two shoot outs for knock out spots in BC3 first thing on Sunday. Reigning champions David Smith (BC1), Tim Hayes (BC2) and Stephen McGuire (BC4) all navigated safe passage to the semis. GB squad members Claire Taggart, Will Hipwell and Evie Edwards will also be playing for places in Sunday's finals. Having both lost to England's Will Arnott, Scott McCowan and Patrick Wilson will go head to head for a semi final position against World Number 2 Jamie McCowan. Stephen McGuire and David Smith MBE have both been named in Great Britain's 10-strong squad for the BISFed 2018 World Boccia Championships that take place at Exhibition Centre Liverpool from 12-18 August. Smith, who lives in Swansea, can boast four Paralympics medals including individual gold from Rio in 2016. He added European Champion to his long list of titles in 2017. They will be joined by five other Paralympians Claire Taggart (Larne, Northern Ireland), Jamie McCowan (South Ayrshire), Patrick Wilson (Edinburgh)) Jess Hunter (Staines, Middlesex) and Evie Edwards (Elmsett, Suffolk). New faces in the squad complete the line-up. Swansea’s Ricky Stevenson impressed selectors at the 2017 UK Championships where he pushed his mentor David Smith all the way in two close matches. He made his international debut in the 2018 Regional Open Madrid. Will Hipwell (Papworth Everard, Cambs) made his international debut in 2017 while Louis Saunders (Bognor Regis, Sussex) is the youngest player on squad. At 16, he is currently juggling his training with GCSE studies. "The squad is approaching the event with high hopes and confidence. While the line-up includes previous Paralympic and World medallists such as David Smith MBE and Stephen McGuire, it also contains athletes looking to make their mark and deliver significant performances on the world stage, demonstrating a real strength in depth across the four classifications. The Brits will be joined by around 180 other athletes from 32 nations from right around the globe. They will descend on Liverpool to battle it out for World titles as well as ranking points ahead of the Tokyo Paralympics in 2020. With 100 days to go until the BISFed 2018 World Boccia Championships in Liverpool, Paralympic gold medallist David Smith MBE today unveiled a £32,000 legacy masterplan to improve the lives of local people with disabilities. The funding will be invested into establishing a brand new boccia club in the centre of the city. Boccia England will be working with local partners to deliver ‘come and try’ sessions in a range of community settings as well as attending local disability sport festivals and events. Competitive opportunities will also be set up so that players can thrive and improve in the sport. Meanwhile, there will also be a drive to recruit and train local volunteers to support the World Championships as well as future local events and activities. And while the world’s best boccia players will be competing for World Championship titles, beginners and those curious to try out the sport themselves will be able to get involved in taster sessions every day at the event. Local schools will also be ringing the bell for boccia. The Boccia Skills Award will help pupils develop innovation, responsibility, resilience, communication and evaluation. “When we were bidding to host the World Championships, we always knew we wanted to ensure that this was not just a major world class event where the people of the City of Liverpool could come and see the best players from around the globe in action, but also an opportunity for the local community to try out the sport for themselves. Liverpool’s Assistant Mayor and Cabinet Member for culture, tourism and events, Councillor Wendy Simon, said: “We are committed to making it easy for everyone to access sport, and aim to breakdown any barriers which may prevent disabled people from taking up an activity. “The Boccia World Championships is one of the highlight sporting events of our Liverpool 2018 programme, and we are pleased to be able to shine a spotlight on this competitive activity which will have a tangible legacy in Liverpool. The World Championships – which is funded by The National Lottery - is set to attract 190 players from 33 countries to Exhibition Centre Liverpool from the 12-18 August 2018. Athletes will battle it out for world titles, as well as crucially important ranking points ahead of the Tokyo Paralympic Games in 2020. 2018 World Boccia Championships has been made possible thanks to UK Sport’s National Lottery funding through its Major Events Programme. The Boccia UK squad will travel to Madrid this weekend for the first competition of 2018. The BISFed European Regional Open will take place in Pinto with competition from the 27th to 31st March. The squad have been training hard over the winter since the successful European Championships in October 2017 that saw David Smith, Jamie McCowan and Stephen McGuire all crowned individual winners. Following Madrid the squad will travel to Canada in April and Portugal in July before the year's main event, the World Boccia Championships in Liverpool in August. First though they must brush off any cobwebs in Spain in a field that contains a mix of newcomers and world class players. David Smith and Ricky Stevenson will compete in the BC1 class with Welshman Stevenson making his international debut following a strong showing at the 2017 UK Championships. He pushed World Number 1 Smith hard at that competition and will be keen to make an impression at this level. Smith's main opposition with be the Netherlands Paralympic Silver medallist Daniel Perez. The highest ranked player in the BC2 competition is Bernd Meints of the Netherlands at 10 so there is an opportunity for Claire Taggart and Will Hipwell to make an impression on the competition. Leading the way in the BC3 event is Greek Paralympic legend Greg Polychronidis, the current World number 2. He is not unbeatable however as Scott McCowan overcame him at last years equivalent event in Sant Cugat. World number 4 Jamie McCowan and 10th ranked Patrick Wilson will also be in the mix for medals. Stephen McGuire tops the BC4 world rankings with Laszlo Hedegus of Hungary his closest challenger at 18. However half the field of twenty are new athletes requiring classification so there is the potential for a bright new talent to emerge. Evie Edwards and Louis Saunders, both taking a break from studying for their degree and GCSE's respectively, will also have the chance to shine, with Edwards having beaten Hedegus to Bronze in Sant Cugat in 2017. Tickets have today officially gone on sale for the BISFed 2018 World Boccia Championships. The World Championships – which is funded by The National Lottery - is set to attract 190 players from 33 countries to Exhibition Centre Liverpool from the 12-18 August 2018. A limited number of early bird tickets are now available and are expected to sell out quickly. Boccia is a Paralympic sport where the aim is to throw or roll balls closer to the target ball, the jack, than your opponent. All boccia athletes have an impairment that affects all four of their limbs; consequently they play from wheelchairs. It is a sport which requires strategic skill, superb muscle control and precision. “For us as athletes, it’s a huge coup that it is taking place on home turf. Support from a home crowd means everything – we felt it in London 2012 and it was spectacular – and I truly believe that knowing the crowd is willing you on really can lift your performance to another level. “This is also the first ever international boccia event, outside of a Paralympics, that is ticketed so it is a big moment for the sport. The Championship team is being really innovative in the way it is building a brilliant, spectator-friendly event so if you have never seen international boccia before, here’s your chance. We would really love to see as many of you – schools, clubs, individuals and families – out in force to support us,” added David. This is a great opportunity to watch world class sporting action ahead of the Paralympic Games in just two years’ time. But the event also aims to create a long-lasting legacy. A family-friendly sports festival showcasing the sport of boccia and the opportunities to play will run alongside the nail-biting sporting action. Following a strong competition we are pleased to announce that Helen Nicholls has been appointed to succeed Matt Hammond as the Performance Director of Boccia UK. Helen’s background as an athlete, coach and manager within the high performance system - with a number of Olympic, Paralympic, winter and summer sports - will enable her to add enormous value as we develop the potential for the sport further. John Dowson, Chair of Boccia UK, said "We were very pleased with the overall interest shown by a strong range of candidates and particularly pleased that Helen Nicholls will be taking up the appointment. Her knowledge, built up over a number of sports and through UK Sport, will enable her to make a very strong contribution both in this World Championships year and in the future." Helen Nicholls said "I am delighted to be joining Boccia UK as Performance Director and to be given the opportunity to lead such a high performing and respected World Class Programme on the journey to Tokyo and beyond. My background in Sailing, where I was an Athlete at a time when lottery funding was first introduced to the UK system, then moving into Coaching at elite level, before moving into management has given me a unique insight into the complex journey to the top of elite sport. My role of Performance Advisor at UK Sport has afforded me a privileged position in supporting and guiding world class programmes to deliver exceptional performances in Olympic and Paralympic sport. I look forwards to using my experience and knowledge to lead Boccia’s world class team in delivering world class results." BISFed have released their updated world rankings and there are two GB athletes topping their individual classes. The new system reflects the results of every match in a competition, not just the final position, and should be a more accurate way to gauge the best players in the world. David Smith MBE retains his place as World Number 1 in BC1 after going the year unbeaten. 2016 Paralympic Champion Smith claimed individual titles at the Regional Open Sant Cugat, World Open Seville, World Open Kansas and also at the European Championships. He will go into the 2018 World Championships in Liverpool as top seed ahead of Thailand's Pattaya Tadtong, the 2012 Paralympic Gold Medallist. Stephen McGuire climbs to the top of the rankings on the back of another impressive year. With an individual World Championship title earned in China in 2016 the Scot has added Gold medals in the Regional Open Sant Cugat, World Open Kansas and European Championships in 2017. He is one of only two Europeans in the top ten, which is dominated by athletes from the Asian region. European Champion Jamie McCowan is the top ranked GB BC3 athlete in fourth place while Patrick Wilson is in 10th. The BC3 Pair are also 4th. Boccia UK today began the search for a successor to Matt Hammond as Performance Director. 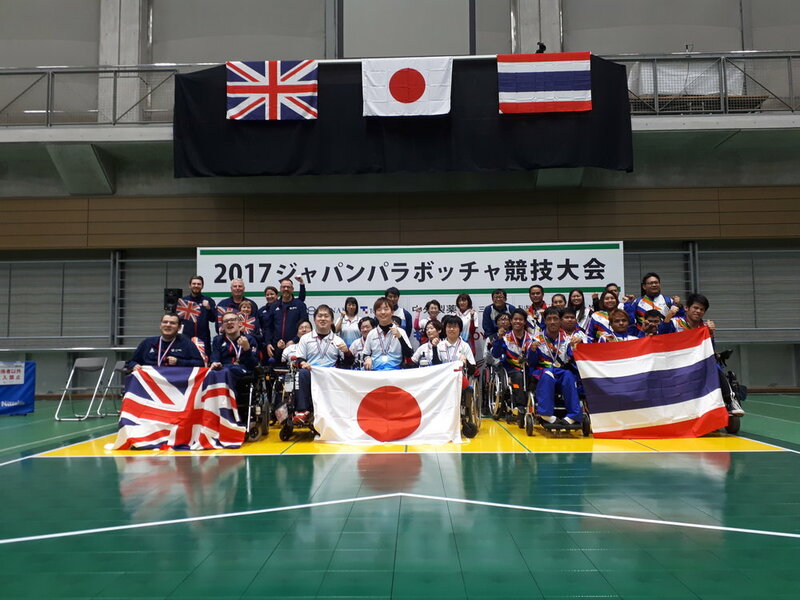 High quality candidates are sought to continue Hammond's good work and lead the squad to the World Championships in Liverpool this year before taking them forward to the Tokyo 2020 Paralympic Games. Adverts have been placed on the UK Sport website and other partner websites. The job advert can be downloaded here and the candidate brief here. Applications must be received by 11th January with interviews to be held on 22nd January. Boccia UK's Performance Director Matt Hammond has accepted a position with the Tennis Foundation and he will be leaving the organisation in the New Year. He has overseen the growth and professionalisation of the Programme and leaves with the sport in a far stronger position than when he arrived. Five medals, including three Golds, at the recent European Championships demonstrates that his successor will have a strong squad to take to the World Championships in Liverpool in August 2018. He will leave with the very best wishes from all Boccia UK's athletes, staff and Board. John Dowson, Chair of Boccia UK, said “Matt will be much missed as the Performance Director of Boccia UK where his impact has been far beyond medals. He has built a vibrant environment with a strong culture within the World Class Programme. In collaboration with our home country colleagues, he and they have also been building a positive development environment with an eye to the future of the sport. I am sure that the Tennis Foundation will benefit from his experience and we wish him all the best in his new role"
Matt Hammond, departing Performance Director said, "It has been great to work with the boccia community over the last 9 years and see the performance end of the sport develop at an elite level. The current programme players are professional in their approach and understand the demands of the modern game, which is highly competitive and reflects just how far the sport has moved. They have been supported by a World Class team of practitioners and coaches and it has been a privilege for me to see the team grow." "The results from this year show how important it has been to work with those players that really have the ability, performance behaviours and mind-set to look at the challenges ahead and what is required to succeed at international level. It will be a great Programme for someone to take on for Tokyo and beyond!" Jamie McCowan and Patrick Wilson headed to Tokyo to compete in the Japan Para Games. Joined by assistants Linda McCowan and Will Wilson, Team Leader Matt Hammond, Coach Glynn Tromans and physio Fran Lace it was a great opportunity to experience the environment ahead of the Paralympics in 2020. As an exhibition event well attended by spectators and the media, GB were due to play the Japanese BC3 Pair twice. Having lost to them at the World Open in Kansas this was a good chance to banish those demons but they did not get off to a good start, going 0-3 down. Jamie McCowan however is starting to specialise in comebacks following his European Gold medal and he and Patrick rallied to win 4-3. The second match was more straightforward with GB taking each end to triumph 4-0 and win the series two nil. David Smith won BC1 Gold, Jamie McCowan with assistant Linda McCowan took the BC3 title and Stephen McGuire grabbed top spot in BC4 in an incredible last day at the 2017 BISFed European Championships in Portugal. Smith had cruised to the final and looked set to continue his tournament winning streak stretching way back into 2016. He cruised into the final, ruthlessly dispatching his opponents en route. He then came up against Mikhail Gutnik of Russia in the final, who did not follow the script and he was 4-0 down with an end remaining. But Smith showed what champions are made of to stun Gutnik and clinch a 5-4 victory. Jamie McCowan's comeback was even more unlikely. Having ground out a 3-2 semi final win over his brother's conqueror, Greg Polychronidis of Greece, he faced surprise package Damian Iskrzycki from Poland for Gold. Iskrzycki had beaten Patrick Wilson in the quarter finals so his quality was clear but he stunned McCowan, taking all six points on the first end. McCowan played himself back into the game with three points in the second end but a tied third end still left him three points adrift with an end to play. Renowned for his fighting spirit, McCowan didn't give up and took four points on the final end to win 8-7 for his maiden European title. Stephen McGuire's comeback came in his quarter final against World Number 2 Samuel Andrecijk of Slovakia, three down after two and taking four on the third end to take the lead. He withheld a fightback from another Slovak, Micaela Balcova, in the semi holding out for a 5-3 win He traded ends with Russia's Sergey Safin to sit 1-1 at the half way stage in the final but powered away to triumph 6-1 and add the European title to his World title from 2016. GB finished the competition with five medals from seven events and topped the medal table with three golds. Great Britain won two Silver medals in the Team and Pairs events of the 2017 BISFed European Championships, held in Povoa de Varzim, Portugal. The BC4 Pair of Stephen McGuire, Evie Edwards and Louis Saunders were closest to a Gold medal as their final against Portugal, who they had earlier beaten at the pool stage, went down to a tie break after finishing 3-3. GB were holding a two point lead as the match went into the final end but Portugal scored two to take the game to the extra end. They had started with a close match against Croatia which they won 3-2 before a 15-0 triumph over Greece settled the nerves. They also won their other two pool games, 5-2 over Germany and a 4-1 win over Portugal. Topping Pool B, they faced the second placed pair in Pool A, Russia. A 5-1 win set up the rematch with Portugal who toppled the Pool A winners and World Number 1’s Slovakia. The BC3 Pair of Patrick Wilson, Jamie McCowan and Scott McCowan also took Silver. They recovered from a 1-4 loss to France in their Pool to record three victories, 4-3 over Portugal, 6-3 over Spain and 7-0 over Denmark. That set up a semi-final against Greece which they started well, taking two on the first end. It was a lead they wouldn’t relinquish, running out 5-2 winners. They then faced Russia in the final, who had defeated Sweden 6-0 in the other semi final. Russia started strongly and were 6-0 up after two ends. GB had to chase the game and were punished further with the match ending 11-0, with Russia taking a first European title. The BC1/BC2 Team of David Smith, Claire Taggart and Will Hipwell were unable to progress from their pool despite a strong start. Victories on the first day against Italy 6-4 and Israel 9-3 put them into a strong position. They suffered defeat to Russia 7-3 but a win in their final match against Slovakia would have seen them through. GB were 3-2 up going into the final end but lost two points meaning Slovakia took the runners up slot behind Israel and went on to take the Gold medal, defeating Greece in the final. The individual competition now begins with David Smith, Stephen McGuire and Jamie McCowan coming into the competition off the back of medals in the recent World Open in Kansas. Great Britain won three individual medals at the BISFed World Open Kansas, with BC1 Gold for David Smith MBE, BC4 Gold for Stephen McGuire and BC3 Silver for Jamie McCowan. Smith sailed through his pool with four straightforward victories, scoring 33 points and only conceding three. A further sixteen unanswered points followed in the quarter final against the USA’s Brigid Mason. The semi final was a closer affair against Slovakia’s Tomas Kral, a player recently reclassified having previously competed as a BC2. Smith however was always in control, and was 5-0 up after three ends before Kral took two consolation points on the final end. That set up a repeat of the Rio Paralympic Games final and Smith was dominant in an 8-0 victory over Daniel Perez of the Netherlands. The Gold medal meant that Smith has won the last five international competitions he has entered and will be red hot favourite to win European Gold in Portugal in October. McGuire followed a similar pattern to Smith as he cruised through his pool with three wins from three matches, scoring 20 points in the process. The draw opened up as World number 2 Samuel Andrecijk didn’t make it out of his pool. McGuire did have to face surprise package Duban Cely of Colombia, part of the Gold medal winning pair that had defeated McGuire and his team mates Evie Edwards and Louis Saunders on their way to the title. McGuire triumphed 7-2 before meeting Canada’s Alison Levine in the semi. McGuire raced into a 5-0 lead after two ends. Levine mounted a comeback but could not catch the Scot as the match finished 5-3. Waiting in the final was the other half of the Colombian Pair, Euclides Grisales. Again, McGuire started strongly and was 3-0 up after two ends. A tied third end took the score to 4-1 and McGuire kept it tight in the final end to only concede one and take the title with a 4-2 victory. The other GB BC4 in action was Louis Saunders, making his international debut. Celebrating his sixteenth birthday while in Kansas, Saunders also notched his first international win, a 4-3 victory over Nobuyuki Takada of Japan. He will also have learnt from defeats in his other pool matches by seasoned athletes Robert Durkovic of Slovakia and Iulian Ciobanu of Canada and has a bright future in the international game. McCowan and Patrick Wilson went for GB in the BC3 event. McCowan topped his pool, with two resounding victories and a narrower 4-2 win over Daniel Michel of Australia who was bidding to add to his Pairs Gold from earlier in the week. Wilson went through second in his pool having suffered defeat in his first match but beating Jesus Romero of Colombia after a double tie break in the last pool game. His quarter final against World number 2 Grigoris Polychronidis also went to a tie break after the game finished 4-4 but for the second time Wilson succumbed in the tie break. McCowan beat Eric Bussiere of Canada 6-1 in his quarter final and Wilson’s conqueror Polychronidis lay in wait in the semi. The Greek was grinding out his route to the final with a point in each of the first three ends but McCowan forced the tie break with an amazing comeback, taking three points on the final end. 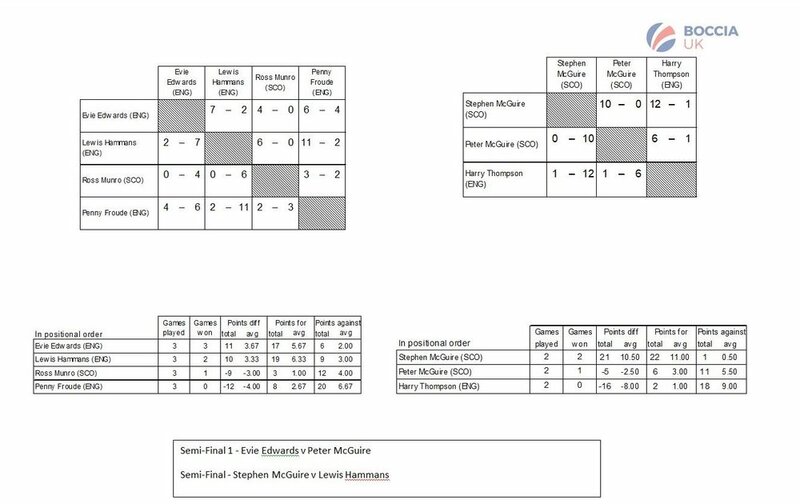 The momentum was with McCowan and he duly took the tiebreak and a place in the final where he would battle Michel for Gold. He was unable to repeat his pool stage victory however as Michel did the double. Earlier in the week the BC3 Pair had missed out on a medal, losing to Canada in the semi final and Japan in the third place playoff. The BC4 Pair did not make it out of their pool after narrow 3-2 losses against both Canada and eventual winners Colombia. The individual medal haul however means that GB travel to Portugal in October with high hopes of medal success. The logo for the 2018 BISFed World Boccia Championships was revealed on Sunday 13th August at the medal ceremony for the 2017 United Kingdom Boccia Championships. The UK Champs was held at Exhibition Centre Liverpool, the same venue that will be used for the World Champs the following year. Paralympic champion David Smith MBE retained his BC1 title while World Champion Stephen McGuire repeated his BC4 triumph of 2016. In the BC2 competition Tim Hayes claimed the title in his first appearance at a UK Champs. In the most dramatic final, Scott McCowan beat his brother Jamie after a tie-break to take the BC3 crown. The World Championships will take place between the 12th and 18th of August 2018. Liverpool will play host to 192 athletes at the most prestigious boccia competition outside the Paralympic Games. Assistant Mayor of Liverpool Councillor Wendy Simon told the athletes at the medal ceremony how thrilled Liverpool was to be the home of the World Championships and that all participants would receive a very warm welcome to a sports mad city. Tickets will go on sale later in the year and the local organising committee aim to stage a competition that will showcase a sport of intriguing tactics, incredible skill and nail biting tension to a new audience. The event is supported by UK Sport, Liverpool City Council and ACC Liverpool Group. The logo was inspired by the rich cultural history of Liverpool and combines details of Boccia court markings into a striking montage.